I feel like I am living in a dream. From last night, I have been wandering beyond. Still wondering where I am. Whether or not this is a good dream, I cannot tell. We had a conversation where we said all that needed to be said. So real that I woke up and wondered how I was sleeping the whole time. You were not there- confusing me. Throughout the day, I continued to float on the cloud you put me on. Sunset time, I looked out the window and found myself surrounded by fluff. Big, puffy cotton balls were glowing in a sea of pinks and purples. Again, I wondered if this was real. It felt like I was floating off to some magical place. I almost expected unicorns to appear. The sea of pink and purple eventually turned into a deep, sparkling blue. Shades of blue swirled around me. Today was beautiful, so dream-like. The dream started when you unexpectedly appeared in my sleep last night. Can this dream never end? Drowsiness is hitting me, snapping me back to reality. Perhaps I will have a déjà vu of today some time in the near future. Art is a fascinating thing. I always thought I understood art… Mona Lisa, Girl with a Pearl Earring, School of Athens, David- all of the popular pieces of art. But the thing is, I never really understood art. In fact, after taking an Art History class this year, I’ve realized that art isn’t just da Vinci and Michelangelo. The “greats” that I knew about were only from the Renaissance period. But this year… I’m so glad that I took Art History. It’s my final year of high school and I think choosing to take Art History was one of the best decisions I’ve ever made. The class has opened my mind to so many new ideas, concepts, artists, etc. Art isn’t just art, it’s about each and every person. With that said, out of the hundreds of pieces that I’ve seen this year, many of them struck a chord with me. Each piece was different and evoked different emotions. Others, on the other hand, had no effect on me. I could probably recognize all of the artwork that I viewed this year. Could I tell you the title, artist, and time period of all of the pieces? Probably not. But there is one that has stuck with me. Death of Marat by David. There was a French man named Marat who became active in the political field around the French Revolution time. He had a skin disease where the sores and lesions on his skin caused him pain. So, he spent most of his time in sewers and bathtubs where he soaked himself in medicinal baths. One day, he was in a bathtub when a woman visited him. She claimed that she had something important to discuss with Marat (she wanted to hold an interview or something?). As she left, Marat’s dear friend, David, walked in and saw Marat in a tub full of blood with a knife sticking out of his chest. The woman had apparently stabbed Marat. Later on, the woman said, “I killed one man to save 100,000.” The painting is based on the image of Marat that David saw when he first walked in. As morbid as the story behind the painting is, it’s beautiful. Marat’s death is so beautiful and yet so sad. David captures his death so well on canvas. 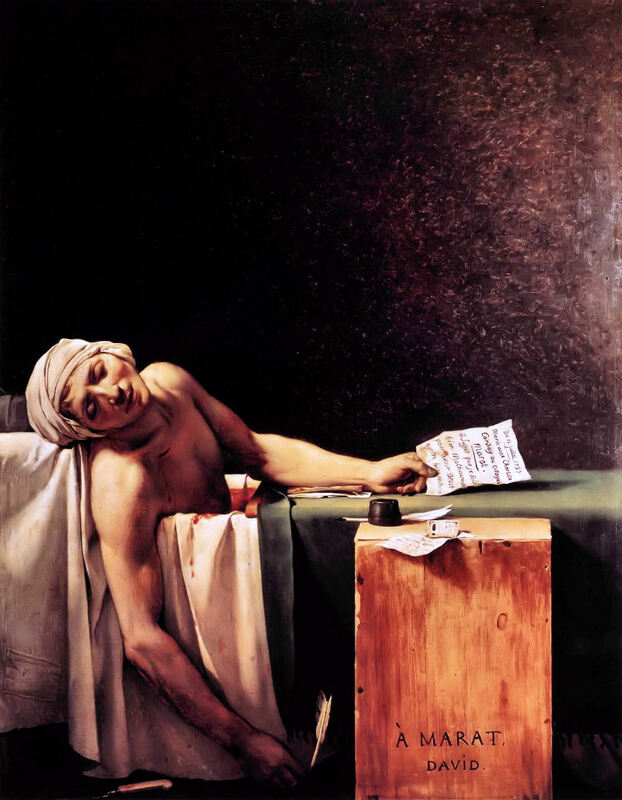 Every time I look at the painting, I feel like crying because I can sense Marat’s pain. In an odd way, that’s what makes it beautiful. There is a word for things that are horrifying but beautiful at the same time… but I cannot find that word on my tongue. For me, this is one of the paintings that will never leave me. It has made its mark on my mind, my heart, and my soul. We were at the Mizy Centre in Seoul… Our task was to design converses for the Shoes of Hope program. Our shoes would then be donated to children in countries where shoes are not a luxury. My group was placed in a small room… There were probably around twenty of us scattered on the floor, each with a pair of blank white converses. In front of every two or three people, a pack of markers lay on the ground. I sat on the window side of the room with two of my friends, Linh and Shoshana. As we started to color in our shoes, two Korean girls joined us- Dongyoon and Lunar. Their English was pretty good, so communicating was not an issue. We shared markers, laughter, conversation, and designs. I think we also learned some new things about one another. When I wrote “La vita è bella” on my shoes, Dongyoon said, “Oh, that means ‘Life is beautiful’ right”? That was when I found out that she took Spanish in school. Then, we all had a little chat about languages. Linh asked Dongyoon and Lunar to write out “saranghae” in hangul so that she could write it on her shoes. When it was time to go, Dongyoon took down our email and facebook information so that we could become friends. The hour went by very quickly… but it was a good hour. It was nice. On the bus ride back, I could not help but smile. That was the first time I accomplished so much in one hour- made friends, did charity work, created art, laughed, talked, took pictures. Anyways, at around 1:00 PM, we left for our visit to Samsung D’light. Totally hoping for a gift bag or something from Samsung, but that never happened. Instead, we had about an hour or so to look around Samsung. I’ll be honest, the trip was pretty boring~ It was basically a building with a whole bunch of Samsung products… the typical phones, cameras, TV’s, etc. My friends and I took a couple of shots that showed up on the huge screen… and the pics were supposed to email to me… but they never sent! aiiiiyaaa they were cute pics too! haha~ But we were told that Korean companies like Samsung were conglomerates, meaning that they make everything! ahha this was really funny because all my life, I’ve known Samsung for electronics. But I found out that Samsung also makes clothing, toothpaste, etc. Really? lol “I brush my teeth with Samsung toothpaste.” or “I’m wearing a Samsung shirt.” Weird. The morning passed by fairly slow. But I did find the lecture on Korea-U.S. Relationship quite interesting. In my school, at least, Korea has never really received the attention it deserves. So, I learned quite a bit about Korea in relation to the U.S. I mean, I never realized how important the relationship between the two countries are. And I’m not going to spoil all that I have to say here because I want to save some stuff to discuss in my ASU club this year ;D haha~ Any who, the highlights of day 5 were the Mizy Center visit and NANTA. I’ll begin with Mizy… so the Youth Network that I was a part of had to decorate “shoes of hope” that were to be donated to kids in developing countries. In other words, we were coloring shoes that were going to be donated to poor kids who could not afford to buy shoes. Between Mizy and NANTA, I hopped around the Sinchon area for a bit… Just a bunch of shopping stores on the streets. Still not very comfortable, I did not wander too far….